I received several emails about giveaways and discounts right as the holiday season started and I've been moving at the same time. Giveaways and discounts are time sensitive so I missed posting most of them. I apologize to the authors as well as readers because there were some good deals to be had. But, since I'm finally back to my computer almost regularly I will post what is left. Three the Hard Way is a micro-anthology of three original tales featuring dirty motives, relentless ambitions, and a lop-sided view of the world. A couple finds a novel way to stop the foreclosure on their home in "The Wrong Job"; a suspenseful chain of letters tells a story of betrayal and violence in "Dead Letter"; and a loving wife decides that killing her husband is the only way to stay alive in "Appalachian Love Story." If you enjoy gritty, unexpected journeys--sometimes violent, sometimes funny, always entertaining--Three the Hard Way is for you. Interested? The trip continues in Three Shorts, Three on a Match, and Three of a Kind. Free on Amazon December 29th - January 3rd. Just in time for the New Year, you can get a free copy of the book that will help you keep your New Year’s Resolution. Achieve in 5! Transform your life in just five minutes a day, is a revolutionary way to do those things you put off because you don’t have enough time. Have you ever thought about writing a book, starting a business, getting in shape, or cleaning out your clutter, but felt like you just didn’t have the time? Achieve in 5! will take you through a process that allows you to get those things done by committing just five minutes a day. Free from December 29 – January 3, make it a New Year’s gift to yourself. Night Sea Journey is driven by psychological drama and supernatural events where reality and nightmares merge. Rich characters, romance, and murder make this little supernatural thriller a fast-paced read. Artist Kip Livingston dreams inside Abasteron House on Horn Island. Mysterious forces invade her mind. Kip dreams of a shadowy firehawk that drags her to the sea and transports her beneath the snaking waves. Grey figures in sea-masks haunt. Kip awakes, but she brings back with her pieces from each night. These supernatural elements are fully alive and so threatening, they drive her into the arms of the sensual Father Raymond Kera. Raymond, a thoughtful but conflicted priest is struggling with his own hauntings. He is exiled by the church to Horn Island and becomes bewitched by the beautiful Kip. If he kills Kip's dreams, will he kill the dreamer? One thing is certain: Kip is compelled to travel these dark nights beneath the ghost-grey sea to reach her journey's end. "Paula Cappa’s new novel Night Sea Journey is a powerful page-turner – enigmatic, surprising, and completely engaging … a wild ride over dangerous and previously uncharted terrain." "Night Sea Journey is one of the most interesting novels I’ve come across in a good long time! The writing is good, the story is truly engaging, the characters are memorable, and as far as this editor is concerned, the philosophical base is right on!" "Night Sea Journey" is a startling story that captures the reader from the first page, through strong character development and a robust vocabulary. Paula Cappa's characters are three-dimensional – the kind the reader remembers long after the story has been read. Her descriptions of setting bring the story to life in the mind's eye, while her dialogue flawlessly carries the story from one stage to the next. Cappa joins fantasy with religion to both captivate and intrigue. Her narrative draws the reader through the fantasy of dream terrors with disconcerting clarity. This story is a fast read that holds one’s attention from beginning to end." The new trailer's kitchen before the new flooring was installed. The hallway before the new flooring. The little girls' room. This is an "extra" that we didn't have in the other trailer. I have a LAUNDRY ROOM. It's nice to not have the washer and dryer IN the bathroom. My oldest daughter's bedroom is 14 x 16 with a "spacey" closet. Her bedroom in the other house was 14 x 12 and she had to share it with the two little ones. We have two bathrooms. One in our bedroom and one for the rest of the world. This picture is before the hubby put in the new flooring. A picture taken from the hallway of the kitchen and living room before the new flooring was installed. A picture of the kitchen (the living room, too) before the new flooring was installed. This is our icky old trailer. We paid $2500 for it and I think we overpaid. This is a picture after the skirting was removed the morning they moved it. The moving of the trailers makes me nervous so I took off and took the little ones for a drive. We found a cow grazing with turkeys. They didn't move it far (yet.) All of our stuff is still in there. We are still transferring it over. Ooooh - new trailer. But, wait.... Is it stuck? YEP. There is a pond on the left and a creek on the right of this little road. Nice that the tongue decided to buckle right here. They spent the rest of the day and the better part of the next morning trying to get it out of here. As soon as we got heat and water we put up a tree. The girls needed this. They did a great job decorating, too. The hallway after the new flooring has been installed. Check out my little robot sweeper at the bottom of the picture. I got her with my credit card points. I think the kids think she's a pet because they follow her around as she sweeps and can't resist picking her up as soon as I'm not looking. My new kitchen. I love the job my hubby did with the floor. The view from my bedroom door with the new flooring in and a Christmas tree to the right. We still don't have the TV over here and I'm seriously considering not bringing it over here. Of course, we will, but it's nice that it's not here yet. I've been enjoying it. The view from the hallway. We left the carpet in the living room and I think it looks good with the rest of the flooring. My LAUNDRY ROOM and a small glimpse into the back bathroom with the new flooring. It all looks so much nicer. Special Giveaway – As an early Christmas present Because of the Moon will be available for free for your Kindle Dec 20-23rd. A fast read full of humor and wit. “Obedience is for dogs,” spouts Jay Roberts, a mischievous teen with a wicked sense of humor. Arrested for his involvement in a chop shop, Jay has two choices: go to juvenile detention or move to the impoverished Indian reservation his mother shunned fourteen years ago where his estranged grandfather will oversee Jay’s penance. Either way he won't enjoy the fruits of his latest prank "Rat-Day". Jay doesn’t belong in the run-down village and vows to return to the city when his sentence over, if not sooner. He resents his frequently absent mother for making him move three weeks before school is over. A school where everyone calls him "Apple" for some reason. Jay goes through the motions of his community service while planning his escape. His plan to stop the school bully will either win him the respect of his peers or turn him into "apple sauce". Keeping everyone at arms length, Jay watches with indifference as family by family, the people move away. After thousands of years on their ancestral land the villagers have given up hope of survival. Gradually Jay learns to appreciate his Grampa and the quirky tribe members. When Grampa points to Orion's belt, in the sky, Jay asks "If his belt fell down would we see a full moon?" and the two click. Jay devises a plan to keep the village together protecting the history and tradition he is inherently a part of. When the plan threatens to fall apart can Jay reach out to the unreliable village alcoholic to pull them through? Humanity had passed far beyond any reasonable expectation of redemption. The dark veil of fear and night would descend upon every person on Earth. A frightful, new age had begun. It was the first night of humanity, now known as the Calamity: a time of global crisis that led to the deaths of more than 99% of the world's 13.6 billion inhabitants. Sixty years later, and with the guidance of the Archonae, the survivors live in an idyllic society of secure and protected cities designed to elevate humanity to its full potential and prevent the problems of the past from recurring. However, not everyone is content with life in the new utopia. I'm a big Men In Black fan and really enjoyed this one - even more than the first two. The actor who played the younger Agent Kay, Josh Brolin, did a WONDERFUL job. We got this movie from Netflix but it is also available to rent from Amazon. Synopsis: Agent Jay travels back in time to 1969, where he teams up with a younger version of Agent Kay to stop an evil alien from destroying the future. Studio required notice: Content is protected by U.S. copyright law. Learn More. Sherlock Holmes's sister, Enola, is back on another case! Enola Holmes is being hunted by the world's most famous detective - her own brother, Sherlock Holmes. But while she is on the run in the world's biggest, darkest, dirtiest city, she discovers a hidden cache of charcoal drawings and feels as if she is a soul mate to the girl who drew them. But that girl, Lady Cecily, has disappeared without a trace. Braving the midnight streets, Enola must unravel the clues to find this left-handed lady, but in order to save her, Enola risks revealing more than she should. Will she be able to keep her identity a secret and find Lady Cecily, or will the one thing she is trying to save-her freedom-be lost forever? My daughter has recently decided that she likes the Enola Holmes books and has read another in the series. What follows is her quick review of the book. In the second installation of the Enola Homes series, The Case of the Left-Handed Lady, Enola has made her way in London and is comfortably living as Ivy Meshle during the day and as the Sister of the Streets at night. Ivy Meshle is the fictional "Dr. Ragostin's" secretary. She is a middle class lady who is respectable enough. The Sister of the Streets is a woman in a veiled habit that never speaks. She aids the poorest of the poor called "dosses" or "crawlers" by giving them food, fire, and occasionally a blanket for warmth. She is a way for Enola to help yet not be seen as an upper-classman. Yet, all is not well, for Enola has found that her big brother, Sherlock, is distraught by not knowing of her well being. He is worried for her and is not eating. She feels she must tell her brother of her well being but doesn't have the slightest idea of how to do so without giving away her location. After this discovery she takes her first official perditorian job to find a kid napped girl named, Cecily. During this job she has many close calls of discovery. She meets Sherlock many times, though he does not recognize her because of her disguise. If you want to know what happened in between and at the end, you'll have to read the book. I really enjoyed this book. For a VERY limited time, CRAZY FOR YOU is FREE! WARNING: Please be aware that Crazy For You is a controversial romance. Do NOT purchase this book if you're at all bothered by characters who do drugs, have mental issues, will resort to prostitution when things are tough, or will take revenge to the extreme when crossed. However, if you'd enjoy reading about the emotional journey of some very flawed characters on the road to redemption...read on. Crazy For You is a rags to riches tale set against the backdrop of the 80s, movie stars and rock-n-roll. Be careful what you wish for, you just might get it--but will it be worth the price? "Crazy for You is full of emotional twists and gripping characters you will find yourself thinking about long after you read the final page." - Melissa Ohnoutka, Author of Faithful Deceptions. "I would recommend Crazy For You to anyone that loves a romance novel that is more in-depth than most stories. It is a definite 5 stars for me because I know I will re-read to see what I have missed. This is a novel with many layers." - The Romance Reviews. "Crazy For You is an amazing book. A Must read!" - The Crazy Bookworm. Incredible Dreams - A modern-day ghost whisperer travels through time to save the life of a WWII fighter pilot. Secondary Targets - A tale of suspense and intrigue with a hint of romance. Forgotten Soul - A tale of buried treasure, star-crossed lovers and reincarnation. Vegas, Baby - A continuation of Broken Wings with a romantic suspense flair. Staked - A time-traveling bounty hunter meets a man she suspects is a vampire. Saving Katya - Former lovers are reunited at the Winter Olympics. The Memory Bouquet - The past and present collide in this collection of short stories featuring the Franklin sisters. Trading Up - A high school reunion. A weekend husband. Finally, a chance to save face! The Marriage Bargain - A wealthy Frenchman in need of a temporary wife makes a deal with a tabloid journalist who's posing as a down-on-her-luck American actress. California Girl - West Coast Girlz - Book One. Glamour Girl - West Coast Girlz - Book Two. New job. New name. New assignment. When Alexis Stanton, a.k.a. 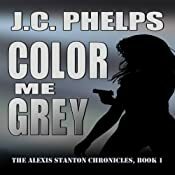 Ms. Grey, is assigned to uncover the true identity of the infamous sniper Penumbra, she's also expected to protect the business mogul next on the assassin's hit list. 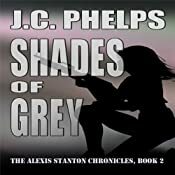 The one person who holds the key to the sniper's true identity warns Alex not to dig any deeper. Penumbra has never missed his mark and will take out anyone who gets in the way. The Red Cross of Gold is a 30-book series, subtitled Assassin Chronicles, following the adventures of a rather old and grumpy alchemist/assassin (800, but looks 35), who lives in Scotland in between wars and assassin missions, working in his alchemy lab, making gold from base metals. Of course, he likes to keep things simple, but his membership in an ancient Order of Templar leftover from the Crusades makes his life a little more interesting than the average alchemist. His primary role as Knight of Death or officially, l'Chevalier du Morte, is making sure that his semi-immortal Brothers do not languish too long in despair should they fall prey to something that cannot be easily overcome. Say, something like a beheading or stepping on a land mine or being eaten by a dragon. As long as the twelve members of the ruling council keep themselves relatively intact, they can live, presumably, forever. Only l'Chevalier du Morte has the mystic Golden Sword of the Cherubim and the ability to release their souls when the time comes. Unfortunately, the world is not willing to go on forever and the Order's goal, which happens to be fighting on the side of Christ at Armageddon, brings many troubles, trials and tribulations for the alchemist. Follow his evolution from simple Scotsman to something totally unexpected in this Epic Fantasy series. Available at Amazon, Smashwords, Barnes and Noble. Click any link below to get any in the series from Amazon for Kindle - Listed in order below. The text link will take you to Brendan Carroll's Amazon author page.